The new student cohort on the MSc Planning programme made a field visit to compare the development of new settlements at Cranbrook (Exeter) and Sherford (Plymouth) at the end of October. Both settlements had been planned since the early 1990s, but the physical construction was now well underway. The students met Naomi Harnett of the East Devon Growth Point to discuss the planning of Cranbrook and Dr Olivia Wilson led a tour of progress being made in Sherford. Daniel Young (Senior Planning Officer, Portsmouth City Council) presented his MSc Planning dissertation results from 2017 at the RTPI General Assembly in October 2018. The presentation explored the progress that has been made by the planning system in England in addressing the challenge of climate change adaptation in coastal urban areas. The results of Dan’s research indicated that the adaptation produced through the planning system remains incremental rather than transformative. It often focuses on experienced hazards, especially flooding, and there's a lack of attention paid to wider impacts of climate change, ie rising average temperatures. Local authorities also faced challenges of limited resources, had experienced an erosion of in-house knowledge and skills around climate adaptation, and faced challenges relating to viability and a lack of strong central government guidance. To mark World Town Planning Day 2018, a number of talks celebrating planning in Plymouth were held at the top of south-west England’s newest and tallest structure, Beckley Point, which gave commanding views of the city and its setting. The talks focused on the post-war reconstruction of the city (Dr Stephen Essex, University of Plymouth), dealing with the Abercrombie legacy (Professor Chris Balch, University of Plymouth), current development projects in the city (Rebecca Miller, Plymouth City Council, and planning the future of the city (Stuart Wingfield, Plymouth City Centre Company). 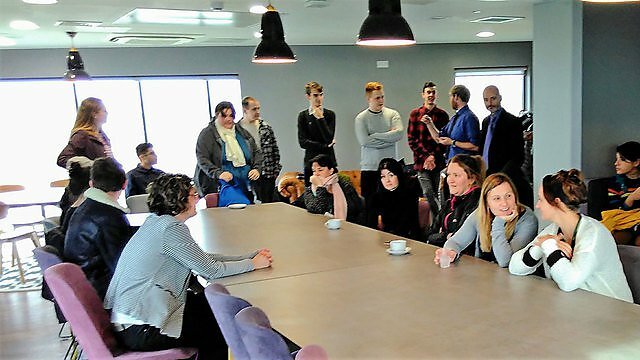 The event was attended by sixth formers from Devonport High School, undergraduates from the University’s geography degree, MSc Planning students, and planning staff from Plymouth City Council. Lord Matthew Taylor of Goss Moor is a Visiting Professor of Planning at the University of Plymouth. He advised both the last Labour government and the Coalition government on planning and housing policy and has served on a number of high profile national bodies. He published the Living Working Countryside review in 2008, and led the creation of the government’s National Planning Practice Guidance. He chairs the St Austell Eco-Town Partnership and provides consultancy on other sustainable development and new community projects. In January 2015, he published with policy exchange his report, empowering localism to solve the housing crisis through garden villages, and he continues to actively engage with government on planning policy and housing delivery. He was formerly the Liberal Democrat MP for Truro and St Austell from 1987 to 2010. He contributes to the spatial planning and sustainable development module on the MSc Planning programme. Professor Chris Balch has been appointed as RTPI Regional Chair of the South West Branch during 2019. This appointment is only the second time that the same person has served in this capacity twice. Chris was also the Regional Chair in 2014. One of his main responsibilities has been to plan and chair about ten continuing professional development seminars during the year as well as steer the activities of the branch, including the annual awards for excellence in planning. A group of five American planning students and their lecturer, Dr Margo Wheeler, from North Arizona University visited the University of Plymouth in June 2018 to learn about the UK planning system and the post-war reconstruction of the city and its positive and negative legacies from Dr Stephen Essex and Dr Olivia Wilson. 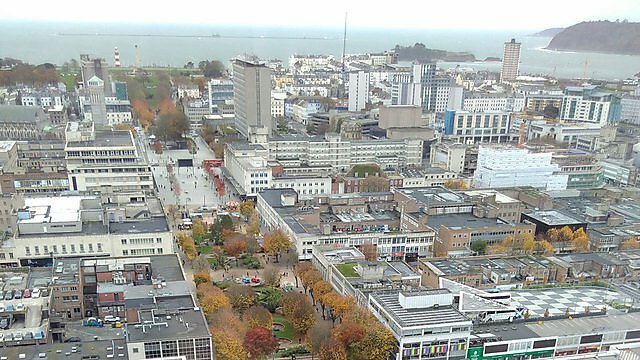 The students were on month long internships with Plymouth City Council, working on a range of projects including the Joint Local Plan, development management, student accommodation and Geographical Information Systems. In January, 2018, students on the PLG503 research methods module reported the results of surveys commissioned by Planning Aid England (PAE) in the South West, part of the Royal Town Planning Institute (RTPI). The aim of the research was to examine the awareness of PAE services in the South West amongst local planning authorities (LPAs), ward councillors and Coastal Community Teams (CCTs) within the top 20 per cent most deprived Lower Super Output Areas in England and to identify the types of outreach work that would best support local communities and groups in the region over the next five years. PAE provides free and independent professional planning advice, which is delivered by around 300 volunteers across the country. Jo Widdecombe and Katie Graham from the task group attended a presentation of results. Three main conclusions arise from the analysis of the results. First, awareness of PAE amongst the stakeholder groups appeared to be relatively low, apart from LPAs, where a total of 60 per cent had used PAE services largely to support neighbourhood planning. Second, all three stakeholder groups felt that PAE might most usefully assist deprived communities through direct, face-to-face support rather than remote web-based or printed materials. Third, there was a recognition that, while community engagement in planning was a function of available resources, participation could be very selective with too much reliance placed on web sites and emails, which stakeholders felt did not provide real in-depth debate and consensus. On the basis of these findings, the task group has recognised the need to raise the profile of PAE in the region and to encourage more volunteers to get involved. Such engagement with communities across the South West can only be delivered through showcasing what PAE does best: providing free independent professional planning advice! Below: MSc Planning students at the University of Plymouth during the presentation of their research findings to Planning Aid England on 18 January 2018. From left to right: Peter Lambert, Ed Crome, Naomi Jackson, Hannah Miller, Joseph Smithyman, Carlotta Molfese, Rupert Warwick, Jo Widdecombe (PAE), Katherine Graham (PAE), Philip Twamley, Oliver Thorogood and Katherine Collins. 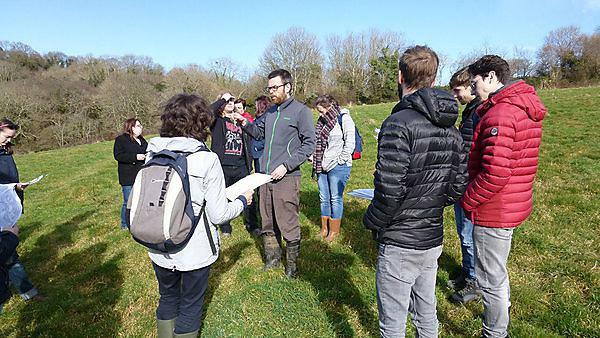 Field visits took place to a number of relevant destinations in South West England, where students had the opportunity to engage with practitioners about a range of planning-related projects. 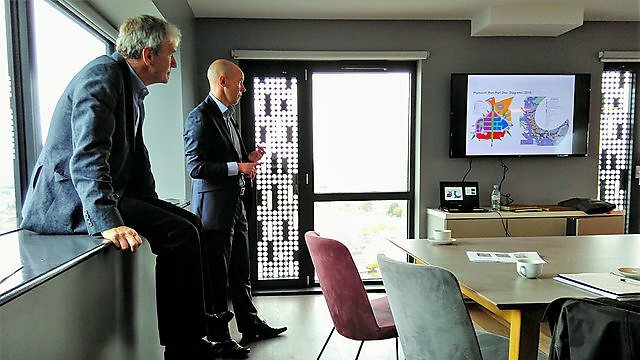 The main growth points in Plymouth and its urban fringe (Sherford, Langage Energy Park, Plymouth airport, and the regeneration of North Prospect) were visited to demonstrate the integration of sustainable development into new development projects. A range of housing developments in Plymouth were also evaluated using the Building for Life criteria as part of the urban design module. The delivery of major infrastructural projects were discussed with visits to the emerging Derriford Community Park, Forder Valley link road and the redevelopment of the City Museum (the ’Box’). Various urban waterfront regeneration schemes, such as the redevelopment of the Devonport South Yard (Oceansgate), Sutton Harbour and resort regeneration in Teignmouth, were also visited. Inside the Langage Energy Centre, opened in 2010 and designed to improve the energy security of the city using the latest and most efficient combined cycle gas turbines. While being a significant infrastructural project for the South West economy, the construction of the power station posed a number of planning and urban design challenges due to its location on the edge of Plymouth, close to areas of outstanding natural beauty in South Devon and Dartmoor. A representative of Plymouth City Council explains the ecological consequences and mitigation involved in the new Forder Valley link road, which will link east and north Plymouth and open up new development opportunities in this part of the city. With the redevelopment of Plymouth’s City Museum into a new flagship cultural destination, to be known as ‘The Box’, by 2020, students on PLG504 development management and delivery module were asked to consider the potential regeneration opportunities for the adjacent land blocks as an assignment exercise. Many of the existing buildings are in a poor condition and could have new alternative uses with a higher value once The Box is opened. In a number of small groups, the students devised new visions for the area considering mixed land uses (including residential, hotels and art workshop spaces) as well as public realm enhancements, within feasibility and viability considerations. A number of MSc Planning students have been successful in publishing the research undertaken in their dissertation project in refereed academic journals. Craig Leger’s research investigated the characteristics of brownfield land in English coastal communities and the challenges faced by planning in the regeneration of these sites through an analysis of the National Land Use Database and a survey of Heads of Planning Service. Sarah Dyke analysed community perceptions towards wind power to test current debates about pre- and post-acceptance opinions of affected stakeholders. 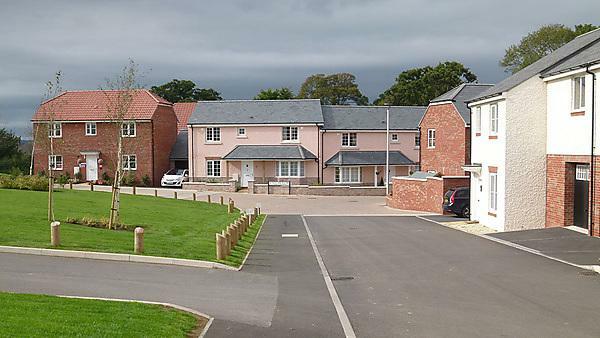 Jamie Staples focused on the delivery of bespoke housing for families with severely disabled children and found that better communication between developers and planners was a critical first step in meeting the requirements. These outputs provide external endorsement of the high quality of research undertaken on the programme at Plymouth. The graduating cohort from the MSc Planning programme at the University of Plymouth on 19 September 2018 on Plymouth Hoe: (left to right) Rebecca Miller (RTPI SW), Dr Stephen Essex (Programme Leader), Christopher Balch (Emeritus Professor), Hannah Cameron (Mid Devon District Council), Helen Govier (Mid Devon District Council), Kris Evely (Torridge District Council), Faye Stewart (Bailey Partnership, Plymouth), Philip Saunders (Savills, Wimborne), Daniel Young (Portsmouth City Council), Sarah Boyle (Torridge District Council), Jonathan Hill (Arup, Bristol), Dr Olivia Wilson (Lecturer in Spatial Planning) and Paul Barnard (Plymouth City Council). Also graduating were Chris Cummings (Plymouth City Council), Jennifer Joule (Nathaniel Lichfield, Bristol) and Timothy Whipps (East Devon District Council). The graduating cohort from the MSc Planning programme at the University of Plymouth on 14 December 2018 at the Plymouth Guildhall: (left to right): Dr Stephen Essex (Programme Leader), Joseph Smithyman (Marine planner at Marine Management Organisation), Ed Crome (Graduate planner, Ministry of Housing, Communities and Local Government, London), Naomi Jackson (Graduate Planner at XL Planning and Design Ltd., Exeter), Oliver Thorogood (Graduate planner, Stags, Exeter), Peter Lambert (planning Officer, Plymouth City Council); and Dr Olivia Wilson (Lecturer in Spatial Planning). The graduating cohort from the MSc Planning programme at the University of Plymouth on 20 September 2017 on Plymouth Hoe: (left to right) Dr Stephen Essex (Programme Leader), Laura Dymond (Exeter City Council), Daniel Thorning (Plymouth City Council), Sara Jenkins (Mid-Devon Council); Luke Jiggins (wsp, Exeter), Rob Kelley (Teignbridge District Council), Alexis Marsh, Alice Lawman (Robinson and Hall LLP, Hitchin), Chloe Nielsen (Dartmoor National Park) and Michael Joshua (Logistics, Plymouth). Also graduating were Stephanie Wade (Exmoor National Park) and Jamie Quinton (East Devon Council). The graduating cohort from the MSc Planning programme at the University of Plymouth on 21 September 2016 on Plymouth Hoe: (left to right) Dr Stephen Essex (Programme Leader), Anna Houghton (Planning Officer (Policy)), Maidstone Borough Council), Ole Lotvedt (Planning Officer, Bergen Municipality, Norway), Ida Kästel (Planning Officer, Bergen Municipality, Norway), Rebecca Smith (UK Property and Land Specialists (UKPALS) Ltd, Salisbury), Adam Jones (Planning Officer, Westminster City Council), Maria Bowen (Department for Communities and Local Government), Michelle Peart (Department for Communities and Local Government), Professor Christopher Balch (Director of Effective Planning School), Phil Bissatt (RTPI SW Chair) and Jess Maslen (Plymouth City Council). University of Plymouth MSc Planning graduation ceremony on Plymouth Hoe on Wednesday 23 September 2015: (left to right): Professor Chris Balch; Adam Williams (Plymouth City Council); and Dr Stephen Essex. Also graduating, but not in attendance: Matthew James Besant (Redrow Homes), Zdzislawa Kunaszkiewicz (Torbay Council) (Royal Town Planning Institute Prize for Best Overall MSc Planning student and Paul Barnard Award for Best part-time MSc Planning dissertation), and Edward Flood (Stride Treglown). University of Plymouth, MSc Planning graduation ceremony on Plymouth Hoe on Wednesday 24 September 2014: (left to right): Professor Chris Balch; Isabel French (Mid Devon District Council: Paul Barnard Award for best part-time MSc Planning dissertation); Samaria Bezzina (Malta Environment and Planning Authority: RTPI SW Prize for best full-time MSc Planning student and Paul Barnard Award for best full-time MSc Planning dissertation); Dean Titchener (Mid Devon District Council: RTPI SW Prize for best part-time MSc Planning student); Katie Beesley (Plymouth City Council); Tom Westrope (Plymouth City Council); Dr Stephen Essex. First cohort of graduates from MSc Planning (Graduation ceremony, Plymouth Hoe, 18 September 2013): Craig Leger (Genivar, Canada); Ros Baker (Cornwall Council); Sarah Dyke (Cornwall Council); Kathryn Waldron (Test Valley District Council); Tammy Burden (Cornwall Council); Jamie Staples (Buckinghamshire County Council); Hollie Nicholls (Cornwall Council); Andrew West (Dartmoor National Park); Professor Chris Balch; Dr Stephen Essex.